There have been relatively few Chinese themes and characters on British cinema screens - certainly by comparison with those from, for example, India - despite a significant Chinese population since the nineteenth century, two 'Opium wars' with China in 1839-42 and 1856-60, and British control of Hong Kong from 1841 until 1997. Nevertheless, there has been a lasting, if uneven, Chinese presence in British cinema since the early silent era. James Williamson's 1900 'actuality' film, Attack on a China Mission , was a highly topical recreation of that year's 'Boxer rebellion', in which nationalist militants attempted to expel Christian missionaries and other foreigners from China. Unusually complex for its day, it was nevertheless a far from impartial account of the events it depicted - not surprising, perhaps, given that it was actually filmed in Hove, and Williamson had never visited China. Early British cinema, like its American counterpart, typically cast white actors in Chinese roles, initiating a 'yellow-face' tradition similar to 'blackface' portrayals. This practice meant that Chinese actors were sidelined altogether or relegated to minor roles, while lead roles were given to white actors. Probably the best-known Chinese figure in British cinema is Fu Manchu. Sax Rohmer 's Victorian supervillain is the archetypal 'yellow peril', drawing on myths linking the Chinese with the mysterious and with the possession of unknown powers, knowledge and intelligence, invariably used to dominate and control. Such ideas reflected prevalent attitudes towards Chinese and East-Asians during the 1920s and '30s, when the 'yellow-peril' was widely associated with organised crime and opium dens. Fu Manchu - evil, vengeful and merciless - personified this threat. The character spawned two successful silent British serials, The Mystery of Dr Fu Manchu (1923) and Further Mysteries of Dr Fu Manchu (1924), with the role going to the Irish-born Harry Agar Lyons , although some Chinese actors did appear - uncredited - in minor roles. Lyons donned yellow-face again as the very similar Dr Sin Fang in a 1928 serial, reviving the character in two later features, Dr Sin Fang (d. Anthony Frenguelli, 1937) and Chinatown Nights (d. Frenguelli, 1938). Better remembered, however, is the series beginning with The Face of Fu Manchu (d. Don Sharp, 1965). Christopher Lee had already played a Chinese villain in the Hammer thriller The Terror of the Tongs (d. Anthony Bushell), and his incarnation of the arch-criminal was memorably malevolent in a lavishly designed and highly suspenseful thriller. The four Fu Manchu sequels, however, brought diminishing returns. The early 1970s saw a worldwide kung fu craze that turned Bruce Lee into East Asia's first truly global star. The boom encouraged Hammer to jump back onto the Anglo-Chinese bandwagon - this time in partnership with Shaw Brothers , Hong Kong's biggest production company. The two 1974 films which resulted, The Legend of the 7 Golden Vampires (d. Roy Ward Baker) and Shatter (d. Michael Carreras), missed the height of the boom and consequently suffered at the box office, though the first of these remains a bizarre curiosity in its attempts at fusing European and Chinese vampire lore. 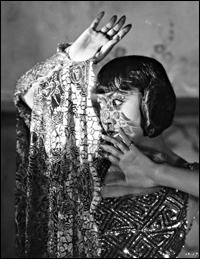 Less nakedly villainous, though every bit as exotic, was Anna May Wong 's beautiful scullery maid-turned-dancer in the late silent classic Piccadilly (d. E.A. Dupont, 1929). The Chinese-American actress had had some success in American silents, and reached a wider international audience as support to Marlene Dietrich in Shanghai Express (US, 1932), but Piccadilly gave her, arguably, her meatiest role. As Shosho, plucked from the kitchens of a fashionable nightclub and turned into the sensation of the West End, she managed to combine the potent sexual allure of a true temptress with the vulnerability of a young girl. Shosho meets a violent end at the hands of her jealous Chinese lover (a far less feted, but equally convincing performance by the forgotten King Ho Chang ), who ultimately takes his own life. A similarly dreadful fate awaited the Chinese protagonists of the British remakes of Java Head (d. J. Walter Ruben, 1934) and Broken Blossoms (d. John Brahm, 1936), played respectively by Anna May Wong and Welsh actor Emlyn Williams . Both films, like Piccadilly , featured mixed-race relationships that end in tragedy, and their approach to their Chinese characters was essentially sympathetic, if patronising to modern eyes. Wong made a further British appearance in the lavish musical Chu-Chin-Chow (d. Walter Forde, 1934), but her career ended in America in increasingly minor and limiting roles, and she all but retired from the screen in 1942, dying in obscurity in 1961. Recent years, though, have seen a revival of interest in the actress, with the restoration of Piccadilly and two major biographies. In Britain, meanwhile, representations of the Chinese at home or abroad became little more enlightened as the twentieth century wore on. Inn of the Sixth Happiness (d. Mark Robson, 1958), based on the true story of a missionary in 1930s China, offered no major roles for Chinese actors and featured both Curt Jürgens and Robert Donat in yellow-face, at a time when blackface portrayals, at least on film, were increasingly frowned upon. The film did, however, offer a minor role for the British-Chinese actor Burt Kwouk . Kwouk became Britain's most successful Chinese actor from the 1960s to the 1980s, best known as Cato Fong, the retainer and energetic sparring partner of Peter Sellers ' comically inept Inspector Clouseau in the hugely successful Pink Panther series, although he was also frequently cast in Japanese roles, as he was in You Only Live Twice (d. Lewis Gilbert, 1967) and in television's Tenko (BBC, 1981-84). The early 1970s and early 1980s saw Black and Asian-British filmmakers finally making some inroads into the British film industry, but it was not until 1986 the first truly Chinese-British feature, Ping Pong (1986), reached the screen. Directed by the British-born director Po-Chi Leong , who had directed several features in Hong Kong, the film was a rich, lively tale set in London's Chinatown, with a largely unknown cast - excepting David Yip , best known as TV's The Chinese Detective (BBC, 1981-82). With an imaginative script that played wittily with traditional Chinese themes of family responsibility and duty, Ping Pong was a welcome riposte to decades of narrow stereotypes. Though critically lauded, however, the film failed to find the success it deserved, and neither it nor the less well-received Soursweet (d. Mike Newell, 1988) has so far heralded the arrival of a healthy British-Chinese cinema. While China and Hong Kong-based directors like Zhang Yimou and Wong Kar-Wai have achieved arthouse and even mainstream success in Britain, the most recent British-Chinese feature, BBC Films' Peggy Su! (d. Frances-Anne Solomon, 1998), failed to receive a proper release, despite some favourable reviews. Perhaps new filmmakers such as Jane Wong , whose graduate film from the National Film and Television School, Dim Sum (2002), was shown to acclaim at the 56th Edinburgh Film Festival, will be able to make a greater impact in the future.